Spring is a good time to head to Grant Park in Chicago for an afternoon walk. This time of the year the sky is often crystal clear blue and it is still cold so it is not so crowded as in the summer. This gives a lot of opportunities for great panorama pictures. 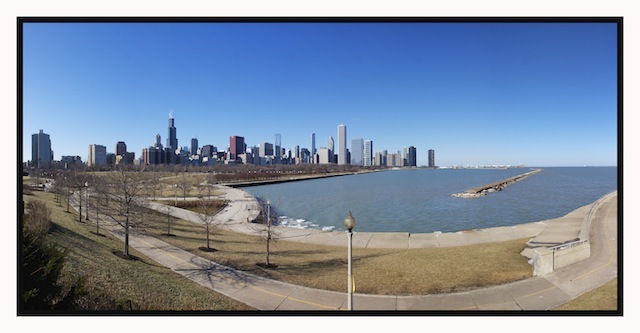 The photograph below was taken on one cold but sunny spring afternoon from the front entrance of John G Shedd Aquarium. The alleys are empty, the barren trees give long interesting shadows and there are still ice pieces on the lake- leftover after long winter months.